It has been designed using our vast experience in slabroller production and incorporates a rack and pinion drive system eliminating the need of maintenance from troublesome wire driven systems, the design allows for infinitely variable thickness of clay to be rolled by means of adjustment of the main roller using a simple threaded adjuster that allows for fine accurate adjustment whilst keeping the equal distance above the table across its length. 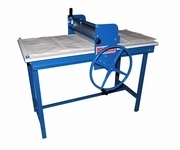 The large single roller is made of a rust proof material to avoid corrosion or contamination of the clay. The slabroller has fully collapsible legs so it can be easily transported and comes complete with a set of high quality rolling cloths , additional cloths can be purchased.